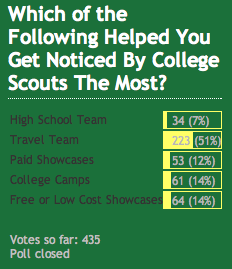 Rounding Third (http://roundthird.blogspot.com/) conducted the following survey of D1 college bound players last year. This is a nationwide survey and includes states like Florida, Texas and Georgia where high school baseball is a little higher level than here in Missouri/Illinois. The article below is from a presentation given at the ABCA convention last year. It provides a good perspective on the concept of “recruiting yourself” into college baseball. BOOTHWYN, Pa. — As prospects navigate the college athletics recruiting process, the level of their “command of confidence” will not only assist them in developing a positive and effective approach to recruiting, it will be “picked up” by the college coaches and assist the prospect in standing out above the rest of the pack. Self confidence doesn’t just “appear” it is a skill that is developed naturally and with experience and can offer student-athletes with an effective tool that can be skillfully used in navigating the college recruiting process. I believe many prospects are under the assumption that the college coaches will routinely contact them by phone or by e-mail in an attempt to recruit them. This may be true for some prospects, but for the majority of athletes who are waiting for the phone to ring, it could be a long and frustrating wait. Coaches are recruiting hundreds of prospects and need to utilize a filtering system to organize their list into a manageable and functional grouping. Coaches are bound by very strict contact rules and it is in the best interest of the prospects to initiate contact with the college coaches and with persistence! If you feel a particular college coach has sincere interest in you as a prospect, you want to develop consistent communication with him and I suggest taking the lead in making future contacts. For instance, you may be discussing a future campus visit and trying to nail down a specific date. Don’t feel nervous in taking the initiative and letting the coach know you will be contacting him in the near future to confirm the visit. This approach is respectful and all you are trying to do is assist the coach, who will appreciate your effort. I think one of the toughest challenges prospects face in the recruiting process is initiating that first phone call to the college coach and for good reason. Somehow, many young athletes envision an unapproachable coach on the other end of the line and view the task of calling the coach with fear. Coaches are former athletes who went through the same process. More importantly, they are educators who “know the stakes” and the importance of the four year college experience. Sure, they are competitive and want to attract the best and the brightest, but for the most part, they want prospects in general, to arrive at a comfortable college choice and one that is the right match. They typically see their role as being a “resource,” with a sincere obligation to provide families with valuable information and to answers their questions. They want to assist the prospect reach his “comfort level” in an effort to begin developing a collaborative relationship. I would not encourage a prospect to pick up the phone and make a “cold call” without preparation. A lot can be learned about a person in a five minute phone call, so make it count! Put together a general list of items you would like to discuss and then trim it down to a bullet list of specific questions you need answers to. Keep your list informative, but short. There is a good chance the coach will cover a lot of ground with his specific questions! You can present yourself in a number of different ways to college coaches and the manner in which you display your personality will directly reflect the level of investment you have made in the college recruiting process. Whether your communication is by phone, email or face to face, “preparation” is the operative word. When you are well prepared to communicate with the college coaches, your level of self- confidence increases and the coaches sense this. Remember, coaches are certainly looking to attract the best student- athletes, but just as important, they are looking for self aware individuals who bring potential leadership skills to the table. Here’s a quick tip: Say you are preparing to make that initial phone call to the coach. Instead of just picking up the phone, take time to go through mock phone conversations with your mom, dad or high school coach in an effort to develop skills in communication. Not every college coach will roll out the red carpet for you and it is important to prepare yourself for the possibility of rejection. It is going to happen and you should not take it personally. Whether rejection is a result of not meeting admissions standards or not having the “stuff” to be considered as an impact player for a particular team, do not waiver from “reaching” toward select academic and athletic programs. The same holds true in the college search, but prepare mentally and emotionally for potential negative news. You might not appreciate the initial “shock,” but by keeping your head held high and accepting the hand you are dealt will only make you stronger and more persistent in the future. The level of confidence prospects project as he/she navigates college recruiting will be directly proportional to the potential success of the plan. Like impeccable preparation for a championship game, the best prepared individuals will have the greatest chance at success if their recruiting plans are sound and they execute with confidence and persistence. The following is an article written 4 years ago when the Gamers program was started. It is a good foundation for the college baseball process. There is a lot “misinformation” in the youth baseball world about the college baseball process. Some team programs and recruiting services market themselves as THE REASON that 17-18 year olds boys get college scholarships or get drafted into professional baseball. Their websites bear lists of players that these businesses take credit for. The truth is that players get college scholarships to play baseball because they are gifted baseball players, outstanding athletes and good students. It is that simple. Secret sauces or hocus pocus are not part of the equation. There are no shortcuts. No program can promise a college scholarship, at any price. But, a program can promise to do these six things. These are core to the Gamer program. This is how college baseball opportunities are created for 95% of aspiring young players. 1. Teaching the student-athlete to proactively market himself to college coaches. This is how players create their own opportunities to play college baseball. It takes all four of these elements, all of which are strongly supported by the Gamers program. When Gamers players do eventually get a college roster spot or get drafted, it will be because they are hard-working, skilled baseball players, good athletes, good students and mature young men. Sure, it doesn’t hurt to have coaches and program directors with a broad network of college coach contacts and a strong reputation for assessing and developing talent. But, as a player, you cannot depend on that unless you develop yourself as a player and a young man. Ultimately, each individual player is in control of this process. This is the reality of college baseball. You cannot pay someone to do it for you. Teenage boys have a lot going on in their lives — school, sports,church,friends, girls… the list is long. Just look at their chaotic Facebook pages. Sometimes it seems like too much going on at once. In a baseball game there is so much information to process — before literally every pitch. Players are expected to react in fractions of a second to a specific game situation, a specific pitch or a specific play. How can they can possibly process all this information? Clearly, it takes strong mental skills to play baseball. Not, necessarily book smarts (but the two are related). It takes the ability to process information quickly, and to make decisions/take action instantaneously. Baseball players process this information faster than the latest Intel chip. With so much information coming at you, an important skill is to focus only on the things that you can control RIGHT NOW. Don’t waste CPU time or emotion on things outside of your control. Action takes place RIGHT NOW, not in the past or in the future. If you focus your attention on things that happened in the past (like your last at bat), it takes your focus away from the present. All action takes place RIGHT NOW. The past is over with and not in your control. Similarly, you will become paralyzed if you focus your attention on the future. The future is important. But, what happens RIGHT NOW dictates the future. Most Gamers want to play college baseball. But, if they just focus on that future dream, at the expense of doing things RIGHT NOW, their dreams will not be realized. Hard work, getter stronger/faster, improving skills, getting good grades, etc.. RIGHT NOW will dictate the opportunity to play college baseball. When players put pressure on themselves, it is largely because they are re-living past mistakes and fear repeating them in the future. Fear of failure is the opposite of focusing on RIGHT NOW. It is the single biggest barrier to success in baseball. So, one secret is to focus your attention on the present, RIGHT NOW. Another secret is to learn to focus only on things that are 100% within your control. This requires that you recognize what is NOT within your control. The opposing players, the umpires, field conditions, etc.. are all things that are not within your control. Nothing gets under my skin more than players that constantly talk about opposing players during pre-game drills. You have no control over them! And, any time you spend focusing on the opposing team takes away from what you should be doing — which is focusing on things you can control. Same thing for umpires. I cannot stand it when players waste time talking about umpires. It is a distraction that results in poor performance. So what are things within your control RIGHT NOW? What goes on in your own head is 100% within your control. What you are thinking, your self-talk, your relaxation — these are all within your control. Repeating your swing, pitching, fielding and throwing mechanics is 100% within your control. A lot of players have great mechanics in drills or in practice, but the mechanics fall apart during games. This is because they lose focus during games. Too much information to process, their reaction time slows down. They forget to focus on things they can control — like repeating solid mechanics. Your effort level is 100% within your control. The Gamers style of play and our infamous pole system is totally focused on things that are within your control on how you play the game. Similarly, being a good teammate is within your control. If you choose to support, encourage, push and genuinely care for your teammates, you will have a lot more success (and have more fun). This is a choice that is 100% within your control. So, there are a lot of things within your control RIGHT NOW. But there are more things that are not. You need to learn the difference. This is a really important lesson to learn — your success in life will be determined largely by how effective you are in focusing on controllables and taking personal responsibility for how you perform on those controllables. A prior sentence is worth repeating, “your success in life will be determined largely by how effective you are in focusing on controllables and taking personal responsibility for how you perform on those controllables”. This is as true in all aspects of your life, not just in baseball. Fall baseball is an important part of the Gamers program. But, it is not a REQUIRED part of the program. So, why play fall baseball? Although the 2010 Fall Season in more that halfway through, I wanted to share my thoughts on Fall baseball. This is geared more for high school age Gamers, but is true at lower ages too. First, if you are going to succeed at something at a high level (like playing college baseball), it requires a lot of commitment and passion. You need to truly love the sport — not many things would stand in the way of you and the baseball field. So, at the most basic level, Fall baseball is an opportunity to do more of something you love. Why would you not do it? Second, we live in the Midwest and the Spring/Summer baseball season is TOO SHORT. High school baseball does not start until March and games don’t start until April. In the mid-South (just 4-8 hours away), high school baseball starts 6-8 weeks earlier. And, in those areas they have lights on the fields and play doubleheaders. A 40+ game high school schedule is the norm. In Missouri, 20 games is the norm. Our high school age players simply do not play enough baseball to effectively compete against players from the mid-South. Stretching the season into September and October is a way to level the playing field. Players can get a lot of reps and improve a lot during September and October. The weather is usually nice, and we can play 20+ games or more. At 16u and beyond, the competition is on the regional and national stage, not the local stage. You need to close the gap versus Mid-South players — Fall baseball provides that opportunity. Third, Fall baseball at 16u and 17u is intensely recruited by college baseball. Plus, there are a lot of national and regional showcase events and college camps in the Fall. You can’t just show up at a showcase in October and expect do well if you have not been playing during August and September. If you fill August-November with tournaments, showcases and camps, you can greatly enhance exposure opportunities. Fall baseball is a great fit with the college recruiting calendar. 1. Baseball is something that you are committed to and love. 2. Opportunity to extend the season, and close the gap versus Mid-South players. We know that some high school age players play football and soccer at the varsity level. We do not want to take that away from them. There is nothing like playing a varsity sport under the lights on Friday night. But, you need to recognize what you are giving up by skipping Fall baseball. If you skip Fall baseball during your high school years, you will get fewer opportunities to play college baseball. That is a cold reality. I can point to 2-3 2010 Gamers that would have had better college opportunities if they has played Fall baseball instead of football after their junior year. For some players, that is a tradeoff they are willing to make. For other players, they are making the tradeoff without knowing it. Also, we know that some families try to save money by skipping Fall baseball. We tailor the Gamers fall programs to be very affordable — a lot of baseball for not much extra cost. For the reasons listed above, trying to save money by not playing Fall baseball is NOT the recipe for success. Penny wise, pound foolish.